Lou Reed's work has been treated to posthumous box sets and poetry collections, but now the Velvet Underground frontman has been honoured with a slightly more unique piece — a custom library card. 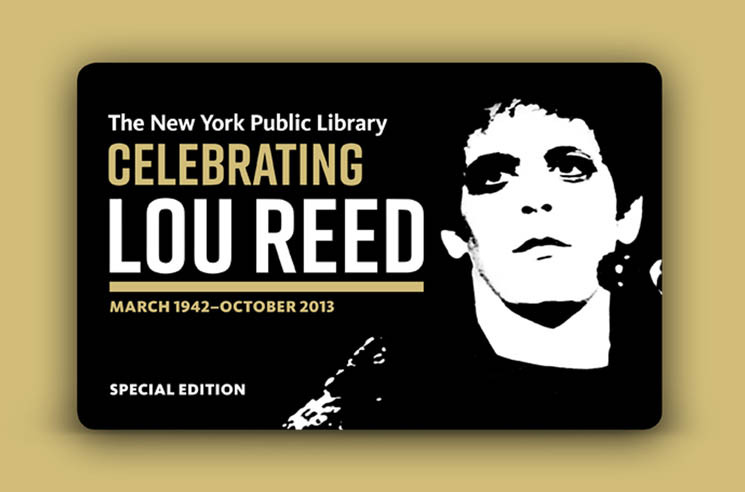 To mark the opening of the Lou Reed Archive at the New York Public Library's performing arts branch at Lincoln Center, the system has released 6,000 limited-edition library cards featuring a photo of Reed. The image that appears on the special cards was taken by Mick Rock in 1972, and famously appeared on the cover of Reed's Transformer album. The archive project was created in conjunction with Reed's widow, Laurie Anderson, who shared the massive collection of notes, photos and recordings with the NYPL. See a preview of some of the archival material here via the New York Times.